Susan Pigg, business reporter for the Toronto Star, recently published the following article on the impact of the extreme cold weather this winter on new condo construction sites in Toronto. The ice storm left over 250,000 Torontonians without power over the Christmas Holidays, and new condo builders were also hit hard. “Construction is an industry where numbers really count, but there is one these days that matters more than most: –15C. That’s the point at which construction cranes and hoists start seizing up, concrete can no longer be poured and work sites are forced into hibernation. “The last two or three weeks have been a disaster,” veteran construction expert Anthony Pignetti said Tuesday. “This has been a very unique winter between the ice storm and the deep freeze and everything in between. Pignetti, vice-president of construction and site operations for Cityzen Real Estate Group, says this winter’s extreme start has already added millions in costs and will likely delay move-ins at some of the eight condo and office projects his company currently has underway across the GTA. All but interior work has been stopped at its skyscraping downtown L Tower the last few days and it could be Friday before things warm up enough that all 110 staff are back at work. 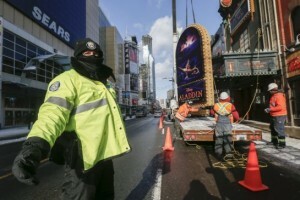 Right now some 35 to 40 per cent of the construction workers usually on the site, including the operator of the massive crane now frozen roughly at the 59th floor, aren’t able to do their jobs owing to wind-chill ratings of –30C or –40C.